I like serving nice breakfasts on holidays and special occasions (like this coming Easter Sunday), but to tell you the truth, I am not a high-energy person in the morning. I prefer easing into the day with a cup of black coffee (or two or three) and reading the paper before I do anything productive. I love breakfast recipes in which the work is done the day before, so I can just pop it in the oven in the morning. 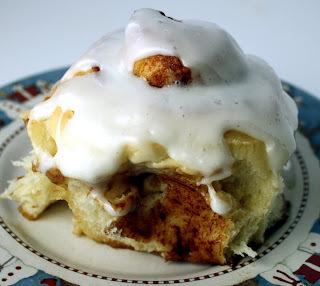 When my son asked for cinnamon rolls for his birthday breakfast in January (yes, I'm that behind in posting), I looked for recipes for cinnamon rolls that could be done that way. I ended up combining recipes from two trusted sources -- Molly Wizenberg (of Orangette fame) and Alton Brown (of Food Network fame). Both recipes had elements I didn't like. Molly's called for kneading by hand -- I got a KitchenAid stand mixer to avoid doing that -- and it seemed skimpy on the glaze. Alton's had buttermilk, which I didn't have in the fridge, and called for four egg yolks, and I hate discarding four whites if I don't have to. (Yes, I know I could use the whites for various things but they always wind up in the trash.) So I combined what I liked about two recipes. The rolls weren't hard to make -- just remember that the dough needs a couple of hours to rise, so don't get started at midnight (something I tend to do). And I loved that they were coming out of the oven a little over an hour after I woke up. 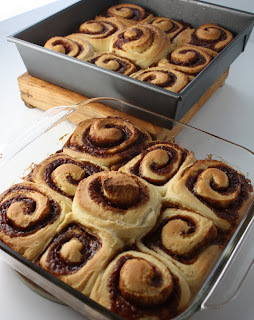 When the rolls came out of the oven, they were divine -- soft and tender and loaded with cinnamon flavor. They were perfection -- for about the first two hours. Then they started to dry out. By the next morning, they were pretty close to stale (although they were ok reheated in the microwave, as long as you ate them right out of the microwave). 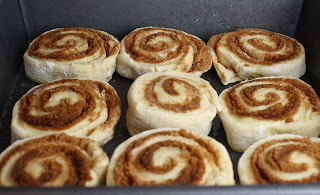 I'm way behind on my Easter preparations, but if I decide to make these for Easter morning, I'll probably either freeze one of the pans of the baked rolls, unfrosted, or freeze the dough of one of the pans before baking. I'll let you know how that works out. In the meantime, I'm sending this to Yeastspotting, a great blog event devoted to yeast breads or recipes made with bread. It was started at Wild Yeast, a fantastic blog devoted primarily to baking bread, and is hosted this week by Zorra's blog -- head over there to check out other great bread recipes! Combine milk and butter in microwave-safe cup or bowl. Microwave on high until butter melts and mixture is just warmed to 120°F to 130°F -- it will feel like the temperature of a nice warm bath or shower -- mine took 1 1/2 minutes using cold milk and butter. Pour into bowl of stand mixer fitted with paddle attachment. Add 1 1/2 cups flour, sugar, egg, yeast, and salt. Beat on low speed 3 minutes, stopping occasionally to scrape down sides of bowl. Switch to dough hook. Add 2 cups flour. Beat on low for about 10 minutes until flour is absorbed and dough is moist and just barely sticky, scraping down sides of bowl. 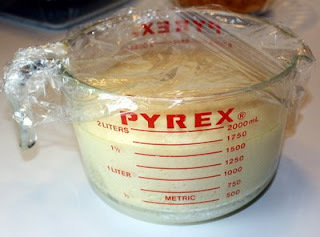 If dough is very sticky, add more flour by tablespoonfuls -- but you are better off having the dough a little too sticky than adding too much flour. It will become less sticky after it rises. Form dough into ball. Punch down dough. Transfer to floured work surface. Roll out to 15x11-inch rectangle. Brush much of the melted butter over dough, leaving 1/2-inch border. Sprinkle cinnamon sugar evenly over butter. Gently press the filling into the dough. Drizzle with the remaining butter. Beginning with the long edge nearest you, roll the dough into a tight cylinder. Firmly pinch the seam to seal and roll the cylinder seam side down. Very gently squeeze the cylinder to create even thickness. With seam side down, cut dough crosswise with thin sharp knife into 18 equal slices (each about 3/4 inch wide). Spray two 9-inch square glass baking dishes with nonstick spray. Divide rolls between baking dishes, arranging cut side up (there will be little space between rolls). Arrange rolls cut side down in the baking dish; cover tightly with plastic wrap and store in the refrigerator overnight or up to 16 hours. Wow! You really took the best of both worlds! Great job! Make sure you leave one for the Easter Bunny. Oh my. Those look amazing. I love cinnamon rolls. I think they're great for breakfast, but I could also eat one for dessert. These look spectacular! Tracy, those look so good. I'm with you about early breakfast. I do breakfast best about 11 am. 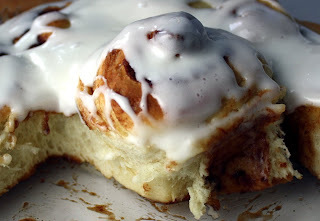 I have to make these because I'm always ending up with that Dough Boy for breakfast cinnamon rolls. Need to upgrade to the homemade rolls. Your rolls look absolutely delicious! It's been too long since I last made cinnamon rolls, and this sounds like a great recipe. Do you know how many rolls this yields? Do you know how many rolls this yields? Thank you! I just made these last weekend with your recipe (I used freshly ground whole wheat flour instead) and they came out AMAZINGLY!!! I even took a picture! :-) Thank you for the recipe! Jacob, glad you enjoyed them! Hey, love the blog and this recipe. I've adapted the glaze slightly; just thought I'd let you know i'm giving you some props on my blog!